The cerulean Koggala lagoon was once a haven to a rich ecological system. 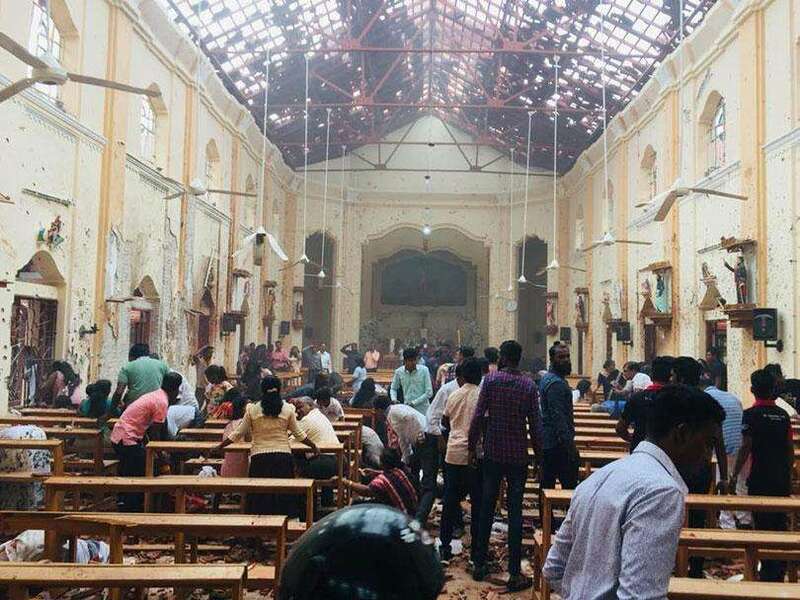 It was also a beauty which was described with much fondness by the famous author Martin Wickramasinghe in his masterpieces such as Madol Duwa. However, human intervention has changed the fate of the lagoon as it is on the verge of going barren. 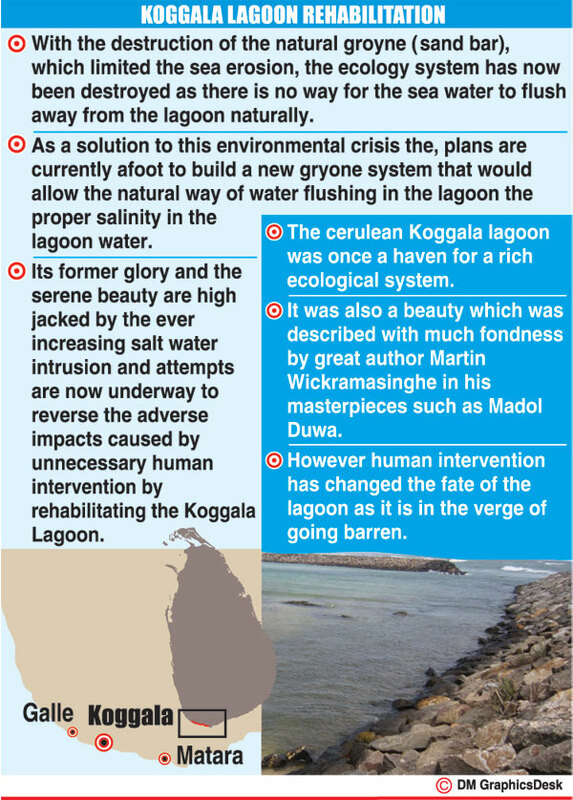 Its former glory and the serene beauty are highjacked by the ever increasing salt water intrusion and attempts are now underway to reverse the adverse impacts caused by unnecessary human intervention by rehabilitating the Koggala Lagoon. “Sand mining along the natural sand barrier started and they did it without any limitations. Now the salt water creeps inland up to the extent that our paddy fields have also started going barren,” lamented Solomon Silva, a farmer in the Koggala area. With the destruction of the natural groyne (sand bar), which limited the sea erosion, the ecology system has now been destroyed as there is no way for the sea water to flush away from the lagoon naturally. It has been an eye opener to all residents as their livelihoods; crops and even their well water are affected and contaminated by sea water intrusion. destruction of the natural sand bar.
" The rehabilitation project of the Koggala lagoon is not just another environmental welfare project but a reminder of how important it is to carry out environment friendly and sustainable interventions when engaged in development activities "
Since sedimentation has begun near the lagoon and the natural flushing away of the water is obstructed the surrounding areas are now prone to constant flooding. Due to the increased salinity of the water the ecological system has also been affected severely. 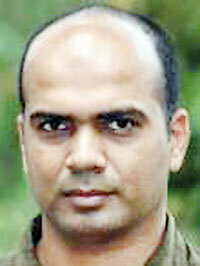 Environmentalist and member of the Galle Wildlife Conservation Society, Nadeeka Hapuarachchi, said that due to increased salinity, the balance in the ecology cannot be maintained as the lagoon’s salinity became almost similar to the salinity of ocean water. Hapuarachchi explained that it affects the fresh water fish as their breeding cycles and survival are dependant upon the low salinity levels in the lagoon water. “For example, a fish species like the “Malpulutta” also known as the paradise fish lays eggs depending on the fluctuations of the PH level in the water. This depends on the increase in the sea levels daily, weekly, monthly and yearly. But when the lagoon water is constantly similar to the PH level in the ocean water the reproduction cycles of these fish get disrupted and they may lay eggs in the wrong season. In turn the new generation is at the risk of being prone to growth difficulties or they might even face extinction if the breeding grounds are undesirable,” explained Hapuarachchi. He also said that migrating fish such as Barramundi could also be at risk as they too need both fresh water and sea water because the males migrate from fresh water to the sea water to meet the females to breed. 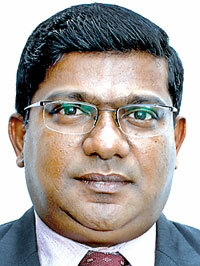 Prof. Gamage who expressed similar sentiments said that not only certain fresh water fish species but the increased salinity in the lagoon water affects the growth cycles of shrimp. He pointed out that shrimp and fish production in the lagoon had significantly decreased over the years. Since 1992 the fish production had dropped from 120 Kg/ha to less than 60kg/ha while the shrimp production had declined from 15-30kg/ha to negligible levels, according to Prof. Gamage. Meanwhile, a stilt fisherman from the area, G.H.G. Thilakasiri, also the chairman of the Stilt Fishermen’s Association said that their livelihoods were endangered when the large scale sand extraction caused the destruction of the sand bar. He said all of the fish shoals start swimming inland and villagers use large nets to catch them in large batches since the lagoon area is now filled with ocean water. “By the time we go to the stilts to catch the fish most of the fish are caught by the villagers and now most fish cannot be seen where we have placed the stilts as the fish breed in ocean water moving into the lagoon. The ecology has completely changed” said Thilakasiri. As a solution to this environmental crisis the plans are currently afoot to build a new system that would allow the natural way of water flushing in the lagoon with proper salinity in the lagoon water. The non governmental organization and Practical Action together has sought to redress the problems by consulting and coordinating with the Coast Conservation Department, Galle District Secretariat and other authorities such as the Agricultural and Fisheries Departments. 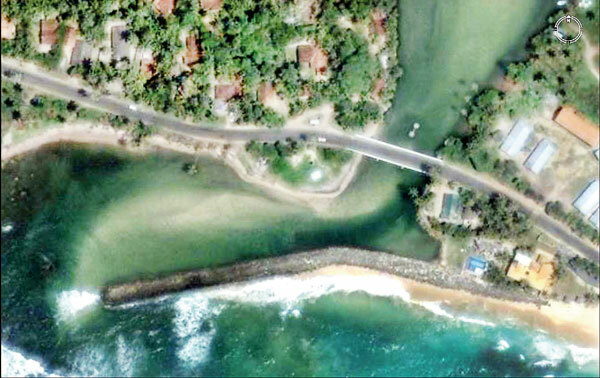 The project of rehabilitating the lagoon is also assisted by experts from the Moratuwa and Ruhuna Universities. In 1995, a gryone had been constructed to protect the pressure exerted on the bridge by the sedimentation. However, even that has not helped the situation as sea water intrusion has continued in a rapid rate. Thus with the assistance of Practical Action the district secretariat has taken steps to improve the water flushing in the lagoon in the natural way. At progress evaluation meetings the farmers and the fishermen in the area said that there was improvement to a certain extent as they could see an increase in fish in the lagoon. However it was noted at the meeting that salt water intrusion still exists to some extent in the inlands as agricultural lands have been affected.
" Sand mining along the natural sand barrier started and they did it without any limitations. Now the salt water creeps inland up to the extent that our paddy fields have also started going barren,” lamented Solomon Silva, a farmer in the Koggala area "
It was agreed upon, at the evaluation meeting that regular tests on the salinity of lagoon water should be conducted. Also the Regional Engineer of the Coast Conservation Department, T.I.C Vinodh informed that a camera tower is being built to monitor the accumulation and movement of the sand bar and its first stage was completed in April. With these improvements the rehabilitation of the lagoon is currently underway but Prof. Gamage pointed out that it would take a long period of time to reverse these adverse impacts on the environment and Hapuarachchi noted, “It has taken years for the villagers to feel the impact of the deterioration of the natural sand bar and in turn the rehabilitation’s effects will not be felt over night because the environment needs time to repair itself”. Thus the rehabilitation project of the Koggala lagoon is not just another environmental welfare project but a reminder of how important it is to carry out environment friendly and sustainable interventions when engaged in development activities. This koggela Lagoon and the Islands should be taken over by the Government.